Full color content maps completely to the 2009 CompTIA Network+ Certification Exam, with in-depth coverage of all objectives. On The Job stories at the beginning of each chapter provide a real-world context for the technology and concepts presented. 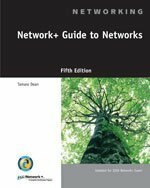 Network+ certification icons in the margins highlight all the materials related to the exam. Features extensive learning tools, including Review Questions, Hands-On Projects, and Case Projects, which allow students to practice skills as they are learned. If you have any questions about this product by Delmar, contact us by completing and submitting the form below. If you are looking for a specif part number, please include it with your message.